We are currently waiting patiently (well, maybe not so patiently!) for the arrival of our second grandchild. Our daughter, Karen and son-in-law, Jared's baby was due yesterday, June 3rd. On Saturday, we drove up to Boston bringing them lunch and distractions. On this trip I remembered to take a photograph of the nursery. Karen and Jared set it up themselves (with a little painting help from us - Benjamin Moore 055-697 Scenic Drive) but her design ideas came from inspirations on my blog. Back when I first started this endeavor, I learned about wall decals. Although designers in the know seem to snicker about them, I thought they were a great solution for high visual impact, low cost and changeability. Karen especially liked the birch tree decals and knew from conception that the nursery was going to incorporate them. The soon-to-be new parents do not know the gender of their baby, but they also know they will be leaving this condo in a year or two. 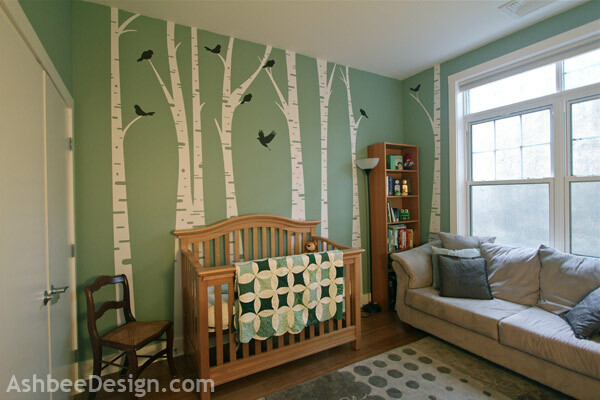 The goal was a nursery design that was not gender specific, or even babyish, but something peaceful and relaxing. Karen started on Etsy and found many decal makers and many birch designs she loved. Her favorite designs were those that went to the ceiling, and because her ceilings are much higher than normal, she needed a designer that would make them a custom length. Combining flexibility and design style led her to EvgieNev's shop. 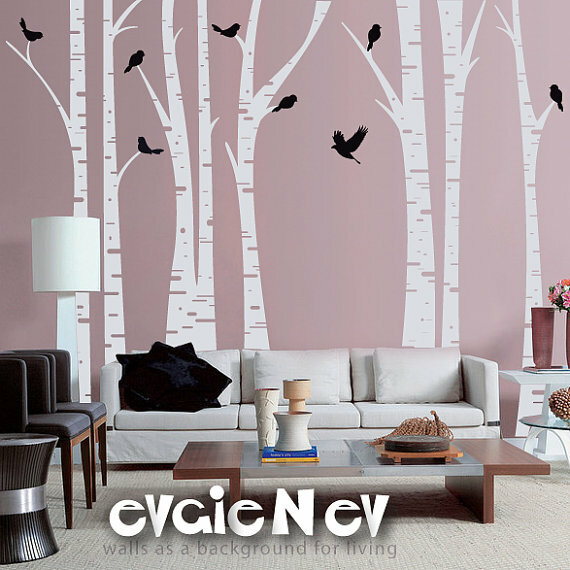 Karen was able to order a contemporay style birch tree, in her needed height with a bark/bird color combination of her choice. What a beautiful nursery your daughter has created....so tranquil. Hope all goes well for the arrival of the baby. Exciting. Thanks, Merry. Very exciting. Grandkids are quite the bonus! We now have a baby for the crib. Granddaughter was born yesterday! All are doing well. Update! We are now blessed with a beautiful granddaughter to live in this room. Congratulations to K & J and welcome Mia! Love this amazing room! Looks fantastic. Congrats on the new addition to your family. Cheers.